responsible animal ownership and care in NSW. Welcome to our first NSW animal welfare e-newsletter. In May, we released the NSW Animal Welfare Action Plan, which included a commitment to engage our stakeholders throughout our program of activity. ​This e-newsletter will be produced regularly and is just one of the ways we are delivering on our commitment to keep you informed about our work to support best practice animal welfare outcomes in NSW. As dry conditions continue across the state, NSW Department of Primary Industries has been working closely with Local Land Services and other agencies and stakeholders to ensure our producers get the support they need. Part of this is ensuring producers are taking steps to safeguard the welfare of their animals. We have prepared online resources to guide decision making in times of drought and to explain everyone’s role in protecting animal welfare, including freight and logistics providers, saleyards and producers. You can find out more by visiting our website. Local Land Services is on hand to assist producers to make decisions about managing stock, advising on joining, early weaning, feeding, and when to destock. The NSW Government is also providing subsidies and support for eligible producers impacted by drought when they are transporting fodder, water, stock for agistment, and animals off properties. More information on financial support services is available by visiting DroughtHub. We will continue to support and work with farming communities while the drought conditions prevail and in future, when the recovery process begins. We hope you enjoy this update and encourage you to share it through your contacts. Anyone wanting to receive updates from us can register online. Delivering changes to better protect animal welfare during critical and emerging incidents. 480 people responded to the discussion paper on improving animal welfare in critical and emergency situations. It is great that so many people have taken the time to share their views with us on these important issues. We are continuing to work through the community’s feedback on these issues as we consider any necessary changes to legislation and penalty provisions and will keep you up to date as this work progresses. The Registry allows pet owners toregister cats and dogs, update their contact details, report missing pets, transfer ownership and pay lifetime registration fees all from a computer or mobile device. Public users of the Registry will notice the website has a fresh look, enhanced navigation and a range of great new features. The upgraded website makes it easier to register pets, return lost animals to their owners and improve animal welfare outcomes in line with recent changes to Companion Animals legislation. Create/add a litter – Allows dog and cat breeders to create a litter and add offspring, making it easier for vets and authorised identifiers to update new animal records with microchip numbers. These improvements are the latest phase in the NSW Government’s staged upgrade to the Companion Animals Register as part of its commitment to responsible pet ownership, and are being delivered by the Office of Local Government. For more information, visit the Office of Local Government website. Earlier this year, draft Standards and Guidelines for Pet Shops and Breeders (dogs and cats) were released for public consultation. The feedback received will be considered in the development of new standards and guidelines in 2019. We recognise the high level of interest in this work and we want to assure you that there will be further public consultation as part of the development of the standards and guidelines. In the meantime, the current Animal Welfare Codes of Practice for Animals in Pet Shops and Breeding dogs and cats apply. The Animal Research Review Panel is in the process of developing guidelines to support research organisations in the rehoming of animals used in research. The Panel is a statutory committee with a broad cross section of stakeholders represented. These guidelines are expected to be finalised in early 2019. 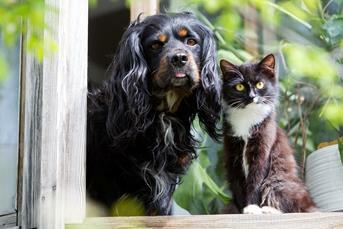 In addition, from January next year, research organisations will be required to report on what happens to domestic dogs and cats used in research once that project is complete. This data will be collected annually and published on the NSW Department of Primary Industries’ Animal Ethics Infolink website. If you are not the original recipient of this newsletter and would like to be sent updates you can register online.